The Mayo Clinic-Illinois Computational Genomics course was held at three separate locations for the first time in 2017. These are participants from the Urbana-Champaign location on the University of Illinois campus. Bright and eager minds are being primed to tackle the big data challenge that comes with genomic medicine. The Computational Genomics class, a collaboration between Mayo Clinic and the University of Illinois at Urbana Champaign (Illinois), is aimed at developing a workforce with skills to more quickly, cheaply, and efficiently analyze, interpret, and apply DNA test results to patient care. Consider this: sequencing just one person’s genome produces enough data to reach from the Earth to the moon. The challenge is sorting through the massive data to understand what is causing disease. This data must be compiled, analyzed, and stored in a format that is easily accessible so physicians can use it at a moment’s notice to make a diagnosis or select an individualized treatment. Course participants from Mayo Clinic's campus in Jacksonville, Florida. Thirty nine attendees also joined in from Mayo's campus in Rochester, Minnesota. The 2017 course was held June 19-23 in three locations: Mayo Clinic’s campuses in Rochester, Minnesota, and Jacksonville, Florida, and at the Carl R. Woese Institute for Genomic Biology at the University of Illinois. 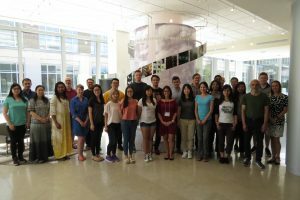 “The Mayo Clinic-Illinois Computational Genomics course represents an excellent opportunity for researchers on the Rochester and Jacksonville campuses to engage in a week-long course that covers all major facets of the discipline. This course provides comprehensive lectures from experts in the field and valuable hands on experience running the latest tools and pipelines,” says Curtis Younkin, a teaching assistant with Mayo Clinic. Researchers at Mayo Clinic and the University of Illinois are collaborating to develop additional technology and capacity to meet the big data challenge as part of the Mayo Clinic & Illinois Alliance for Technology-based Healthcare. Hear leading experts address the challenges of managing genomic data and learn how the latest precision medicine research is being used to improve patient care for many conditions at Individualizing Medicine 2017: Advancing Care Through Genomics.